This article is part of the Best Practices documentation. See http://www.broadinstitute.org/gatk/guide/best-practices for the full documentation set. 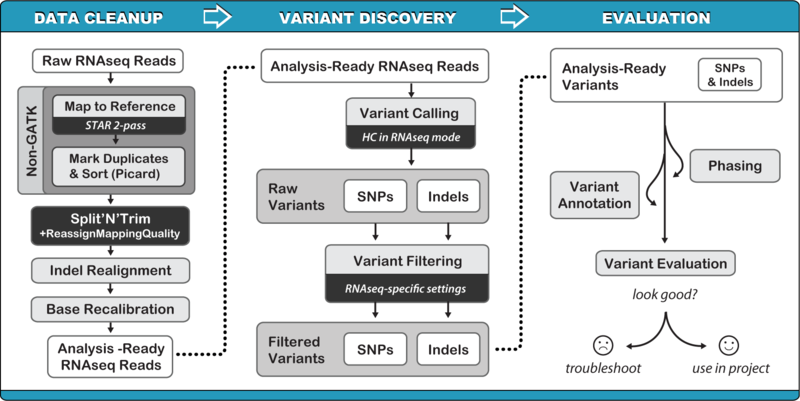 This is our recommended workflow for calling variants in RNAseq data from single samples, in which all steps are performed per-sample. In future we will provide cohort analysis recommendations, but these are not yet available. Compared to the DNAseq Best Practices, the key adaptations for calling variants in RNAseq focus on handling splice junctions correctly, which involves specific mapping and pre-processing procedures, as well as some new functionality in the HaplotypeCaller, which are highlighted in the figure below. The data generated by the sequencers are put through some pre-processing steps to make it suitable for variant calling analysis. The steps involved are: Mapping and Marking Duplicates; Split'N'Trim; Local Realignment Around Indels (optional); and Base Quality Score Recalibration (BQSR); performed in that order. The sequence reads are first mapped to the reference using STAR aligner (2-pass protocol) to produce a file in SAM/BAM format sorted by coordinate. The next step is to mark duplicates. The rationale here is that during the sequencing process, the same DNA molecules can be sequenced several times. The resulting duplicate reads are not informative and should not be counted as additional evidence for or against a putative variant. The duplicate marking process identifies these reads as such so that the GATK tools know they should ignore them. Then, an RNAseq-specific step is applied: reads with N operators in the CIGAR strings (which denote the presence of a splice junction) are split into component reads and trimmed to remove any overhangs into splice junctions, which reduces the occurrence of artifacts. At this step, we also reassign mapping qualities from 255 (assigned by STAR) to 60 which is more meaningful for GATK tools. Next, local realignment is performed around indels, because the algorithms that are used in the initial mapping step tend to produce various types of artifacts. For example, reads that align on the edges of indels often get mapped with mismatching bases that might look like evidence for SNPs, but are actually mapping artifacts. The realignment process identifies the most consistent placement of the reads relative to the indel in order to clean up these artifacts. It occurs in two steps: first the program identifies intervals that need to be realigned, then in the second step it determines the optimal consensus sequence and performs the actual realignment of reads. This step is considered optional for RNAseq. Finally, base quality scores are recalibrated, because the variant calling algorithms rely heavily on the quality scores assigned to the individual base calls in each sequence read. These scores are per-base estimates of error emitted by the sequencing machines. Unfortunately the scores produced by the machines are subject to various sources of systematic error, leading to over- or under-estimated base quality scores in the data. Base quality score recalibration is a process in which we apply machine learning to model these errors empirically and adjust the quality scores accordingly. This yields more accurate base qualities, which in turn improves the accuracy of the variant calls. The base recalibration process involves two key steps: first the program builds a model of covariation based on the data and a set of known variants, then it adjusts the base quality scores in the data based on the model. Once the data has been pre-processed as described above, it is put through the variant discovery process, i.e. the identification of sites where the data displays variation relative to the reference genome, and calculation of genotypes for each sample at that site. Because some of the variation observed is caused by mapping and sequencing artifacts, the greatest challenge here is to balance the need for sensitivity (to minimize false negatives, i.e. failing to identify real variants) vs. specificity (to minimize false positives, i.e. failing to reject artifacts). It is very difficult to reconcile these objectives in a single step, so instead the variant discovery process is decomposed into separate steps: variant calling (performed per-sample) and variant filtering (also performed per-sample). The first step is designed to maximize sensitivity, while the filtering step aims to deliver a level of specificity that can be customized for each project. Our current recommendation for RNAseq is to run all these steps per-sample. At the moment, we do not recommend applying the GVCF-based workflow to RNAseq data because although there is no obvious obstacle to doing so, we have not validated that configuration. Therefore, we cannot guarantee the quality of results that this would produce. We perform variant calling by running the HaplotypeCaller on each sample BAM file (if a sample's data is spread over more than one BAM, then pass them all in together) to create single-sample VCFs containing raw SNP and indel calls. For RNAseq, it is not appropriate to apply variant recalibration in its present form. Instead, we provide hard-filtering recommendations to filter variants based on specific annotation value thresholds. This produces a VCF of calls annotated with fiiltering information that can then be used in downstream analyses. In this last section, we perform some refinement steps on the genotype calls (GQ estimation and transmission phasing), add functional annotations if desired, and do some quality evaluation by comparing the callset to known resources. None of these steps are absolutely required, and the workflow may need to be adapted quite a bit to each project's requirements. Important note on GATK versions The [Best Practices](http://www.broadinstitute.org/gatk/guide/best-practices) have been updated for GATK version 3. If you are running an older version, you should seriously consider upgrading. For more details about what has changed in each version, please see the [Version History](http://www.broadinstitute.org/gatk/guide/version-history) section. If you cannot upgrade your version of GATK for any reason, please look up the corresponding version of the GuideBook PDF (also in the [Version History](http://www.broadinstitute.org/gatk/guide/version-history) section) to ensure that you are using the appropriate recommendations for your version.